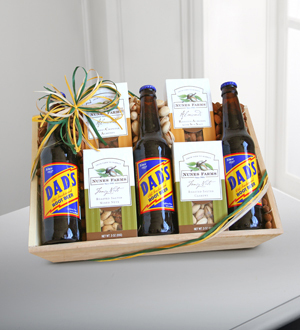 Show Dad you're nuts about him with this array of fancy nuts and thirst-quenching root beer. He'll enjoy roasted salted cashews, roasted salted almonds with sea salt, roasted salted pistachios, and honey cinnamon almonds. Wash it all down with three great Dad's root beers. It's a sweet and savory treat just for him!